“15 years ago remember marshalling at the Fell Relays and thinking how sad it was that Baildon would probably never get a team together for the event. Interest in fell running was so low at the club that I had to join Calder Valley! The words of a fellow Baildon runner yesterday after Baildon Runners competed in the British Fell Relays 2018, finishing 185th overall. Leg 1 was fully marked and run by Andy Robinson who regretted his decision of wearing just a vest! Leg 2 run by Ben Watson and James Wright, with James getting so excited he ran a little too fast down hill and had to use his chin to slow himself down!. Leg 3 required Emma Wilkins and Andy Price to navigate using a map they had only been given minutes after starting their leg, and finally I ran the final leg which included all the best bits of the Lakes ; huge climbs and steep technical descents! This was probably the most enjoyable race I have ever run. I set off and was beating Martin from Saltaire most of the leg but was just beaten by him in the end. 4.5 miles with nearly 2000ft of climbing and one of the steepest muddiest descents I have ever seen. I finished the leg in just under 55 minutes which I was delighted with finishing in 110th place on the leg. Well done to all of the team who faced consistent drizzle and low visibility as they completed their races in the mountains. Nice to see a nice big ‘BAILDON RUNNERS’ flag next to the finishing line too! Its been nearly 5 months since I posted. Mostly because of laziness/busyness, but also because I have not felt strong running. I would not say I have lost my running mojo, just that since the 3 peaks race my knees and body have not felt the same. I was not fully ready for the race and I think I paid quite a big price as a result. I have however been racing and training quite regularly since. The week after the 3 peaks race it was Over the Odda which I ran well and I felt good. 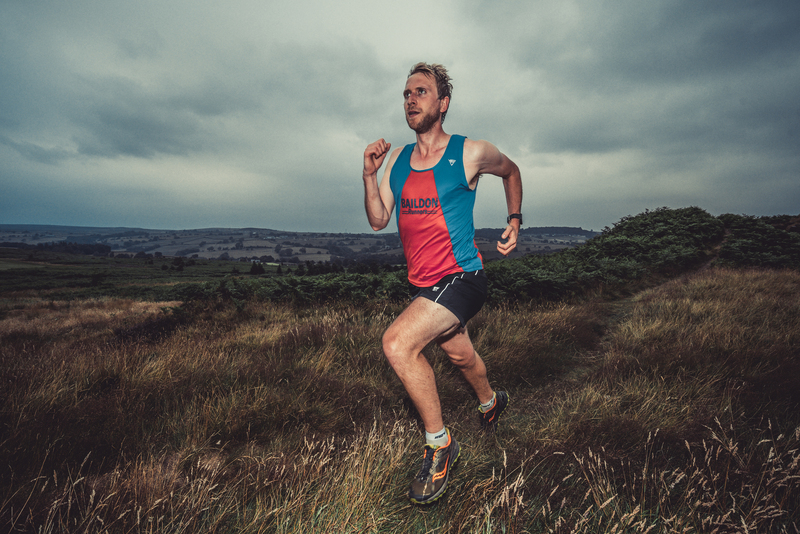 A couple of days after was a fell race in Ilkley which felt absolutely terrible- I really struggled. I took a week off running and started training lightly again. A very hot summer resulted in tough training and some really tough races but recently I have started to feel much stronger.. just in time for the winter league, one of the greatest competitions I have ever been involved in! I have stopper drinking alcohol and eating meat in September and have been running much better. Last week I enjoyed two great races. Firstly the Ilkley incline which is only a mile race! 1 mile uphill! I felt I ran the race well and ran a mile up 500+ft in under 10 minutes. On Saturday I ran my second Hodder Valley Show fell race. This year the show was in Slaidburn and was a different longer route to last year. It was a great route taking runners to the summit of Easington fell. Just over 10k with 1000+ climbing all in the first 3 miles. I felt great and finished in 18th position. Tomorrow is Beefys Nab fell race in Oxenhope, a race in which I finished 4th last year. Fingers crossed that my race fitness will continue improve! A week before I went to the USA i rolled my ankle and took a week off training after slowly upping the miles. Whilst in the USA I ran a good trail race but also drank pints of strong craft beer and consumed pounds of meat. I had 2 weeks on my return to train for the Three Peaks race and managed a 14 miles over the moors and a 10 miler on the canal. Race day arrived and I was extremely excited and nervous. The Three Peaks Race traverses the famous Yorkshire Dales mountains of Pen-y-ghent, Ingleborough and Whernside is one of the oldest, most famous and best organised fell races in Britain. First run in 1954, the Race covers 37.4 kilometres with 1608 metres of ascent and descent over the most rugged and spectacular countryside in the Yorkshire Dales National Park, taking competitors to a height of 723 metres above sea level. I felt confident and enjoyed the climb and decent of Penyghent before a long run to Whernside. After crossing a river the climb up Whernside began which seemed to last forever, getting steeper and steeper. At the top I was exhausted bust felt better as soon as I began to run on the flat. This did not last long as the steep decent soon began and with this which huge lumps of slippy limestone. This is when my right knee started to hurt again, similar to the pain I experienced at the 20 mile Trog. This pain was present for the rest of the race. The climb of Inglebrough began which was equally as steep as Whernside, I had not experienced climbing Ingleborough from this side before. As I was climbing cramp began to creep into my left thigh and after plodding to the checkpoint at the final mountain the cramp really set in. I was unable to run anymore and tried desperately to stretch and massage the area. I decided to hobble towards the marshalls, but as I started to descend Inglebrough the cramp eased and I felt a burst of energy. At this point Ben had overtaken me and I could see him in the distance. Although all mountains had been climbed there was still 4 miles to go. I managed to pick up some speed and overtook about 5 runners including Ben. The finish was getting closer and eventually I got there. Absolutely exhausted. I felt terrible. Tired, weak and sick. This was the hardest thing I had ever done. I completed the 37.4 kilometres with 1608 metres of ascent and descentrace in 4 hours 37 minutes and 15 seconds. Since discovering fell running last year the challenges have progressively grown and this was by far the biggest yet. I am proud to have competed and completed raising hundreds of pounds for Parkinsons UK. I finally managed to travel to the USA to visit friends who live in Indiana. I was keen to find a race to run whilst away and found a great trail race which was part of a series of off road races. The race was at a county park called Eagle creek and consisted of 3 5k laps through woodland trails in the park. I had no idea where I would finish and was delighted to finish as the first M30-35 and 5th overall. Going into the 3rd lap I was 2nd and feel I could have held position if it was not for the strong American craft beer and excessive amounts of meat I had consumed days leading up to the race! Overall a great experience and one to tick off the bucket list. Next : Colorado? Montana? What a season. After only running 2 races in last years WYWL, I managed to run in all the races this season winning points for the team and finishing in the top 5 Baildon each race. For the first time in 25 years Baildon won. In the team event we were numero uno; in the men’s event we were numero uno; in the vets’ event we were numero uno. In the women’s event we were numero dos and in the super vets, we were numero…. Well, it would just be plain greedy and unsporting to win everything. It is quite stunning to win team, men’s, vets and finish second in the women’s events, especially when you consider the quality of the runners in the other 13 clubs who comprise the WYWL. It is a real measure of just how much the club has developed its strength and depth. Half way into the race Dan Naylor magically appeared beside me which motivated me to run as fast as I could to eventually beat him (just). A great technical course with a few steepish climbs through woodland and across fields with a short stretch on road. The conditions and weather were great. Hard firm ground with open sunshine if not a bit chilly! With one race to go in the WYWL it is ours to lose. How incredible it will be if this time next week we have won the league for the first time! Up the BAILDON! I was not aware when I entered but the ilkley Moor Fell Race on Sunday was a Yorkshire Championship race. Which mean the likes of Iam Holmes, Tom Adams, Victoria Wilkinson and other legends were out in force. My only experience of racing in Ilkley was Rombald’s Romp which was fantastic and so was this. It was a frustrating start as 100’s of runners were repeatedly asked to ‘STEP BACK’ as we lined up on a near single file track to begin. I feel I could have run much better but was satisfied with 100th place, 5 miles in 51mins with 1,339ft of climbing in such a competitive race. A fantastic race with a great buff as a race memento. See you next year. I’m Jeff Singleton, a Teacher born in Lancaster currently living in Bradford. Since entering my first running race in 2013 I have developed a passion for long distance and fell running and joined my first club , Baildon Runners in October 2016.